I haven't posted any Japanese recipes. 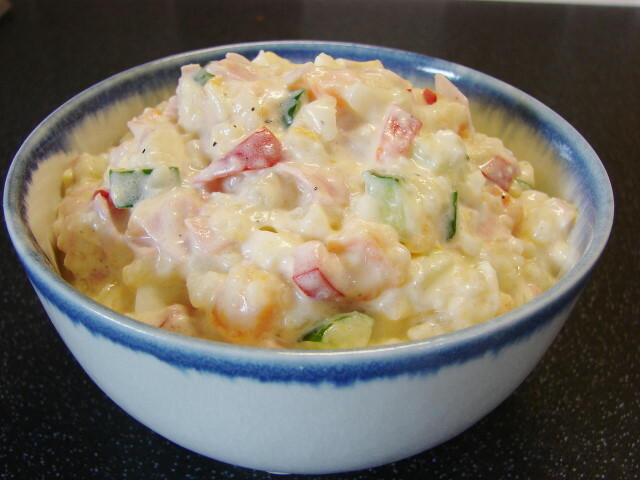 This recipe today isn't traditional Japanese it's western influenced potato salad. I love this, it has so many bits added giving it interesting texture and colourful. It's a meal on its own. Great for a hungry munchy anytime of the day or night. Lovely as filling for crunchy baguette or serve with BBQ. 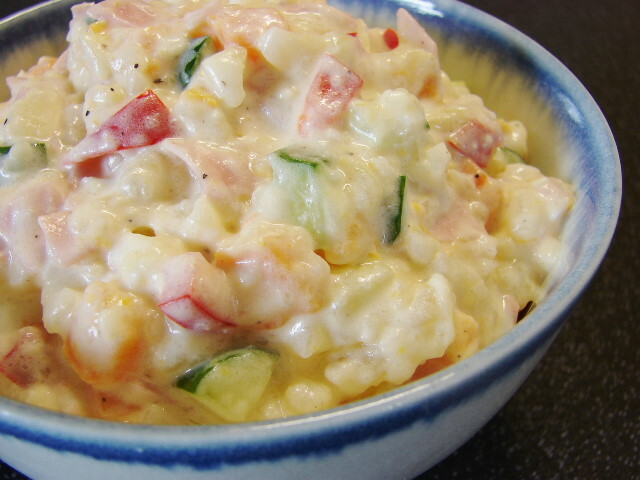 Here is how I make this tasty potato salad. Boil or steam potatoes with skin. When cooled peel and crush. Better lumpy than smoothly mashed. Dice carrot. Steam (or simmer with few tbsp of water for about 10 minutes till water has evaporated) till carrot softened. Leave aside to cool. Put crushed potato into large mixing bowl, mix with mayonnaise, vinegar, salt, sugar, ground pepper. Then add remaining ingredients. Mix. If the salad looks dry add enough milk or water to soften the texture. I normally add up to 1/3 - 1/2 cup milk or water. Can eat right away or chill. Ok to keep in the fridge for couple of days. Thanks Ana. It does look creamy. I only use water to dilute it this time.